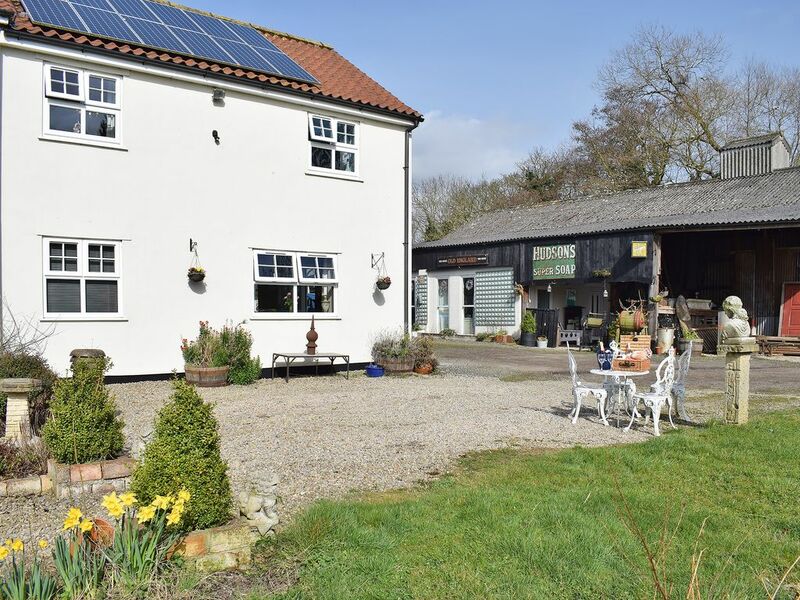 Part of a traditional farmhouse set in a rural area but only 25 minutes from the centre of York, and 5 minutes from the market town of Thirsk. Seventh Heaven is a cottage attached to the owner’s farmhouse set in a rural location under Sutton Bank, a breathtaking vista in the North York Moors National Park which has been voted Yorkshire’s best view in a public vote. Sutton Bank, which looks out over the Vale of Mowbray, topped the poll carried out by the Dalesman magazine. The cottage has been lovingly renovated and enjoys far reaching views from the beautiful grounds, which you are welcome to explore. The owners are also happy to take delivery of supermarket orders you may wish to place when you are self-catering here. Take a short stroll down to the stream, which is part of the Isle Beck system, with a picnic or enjoy time relaxing in secluded surroundings. You can cross the small footbridge further along from the sitting-out area and start one of the many fantastic walking routes which guide you through the countryside. Walk through Sutton Bank and onto The Cleveland Way where you can follow the path towards Whitestone Cliff for fantastic views of Lake Gormire, and across the Vale of Mowbray to the distant Pennines just visible in the distance. The mysterious Lake Gormire is tucked away in dense woodland below Sutton Bank, and is one of only two natural lakes in the county, created by meltwater at the end of the last Ice Age and accessible only on foot. No water can be seen flowing either into or out of it, keeping it at a steady level. The theory is that it’s fed by an underground spring and drained through a channel in the limestone below. The myth is that there is a hidden city at the bottom. There are several ancient abbeys and castles each with their own unique qualities. Just a short drive away you can experience Rievaulx Abbey’s fascinating past and the lives of the monks who called Rievaulx Abbey their home. Thirsk, once home to the novel writing vet, James Herriot has an excellent choice of shops, pubs and restaurants set around the cobbled market square and is becoming increasingly popular due to the TV show ’The Yorkshire Vet’, which highlights some of the amazing sights and scenery in the area. There is so much to see and do in this picturesque part of the North York Moors National Park. Take a steam train journey from Pickering to the gothic coastal town of Whitby, which snakes its way through ‘Heartbeat country’ or step back in time with a visit to Eden Camp. The medieval walled city of York is just 20 minutes away with its many attractions, museums, historic buildings, tours, shops, restaurants and bars within the compact walled city. You’re never far from an awe inspiring moment. Thrill seekers may venture to nearby Flamingo Land for a day at a theme park. The Heritage Coast is just an hour’s drive away if you fancy a day at the beach. Shop 5 miles, pub 1½ miles and restaurant 6 miles. Living/dining room: With electric wood burner, 32" Freeview Smart TV, DVD player and iPod dock. Bedroom 1: With double bed and en-suite with bath, shower cubicle and toilet (also accessed from hallway). Bathroom: With bath, shower cubicle and toilet (also accessed from bedroom 1). Oil central heating, electricity, bed linen, towels and Wi-Fi included. Welcome pack. Large garden with summerhouse, sitting-out area and garden furniture. 2 acres of unspoilt grounds with paddocks (shared with owner). Fly fishing on-site (free of charge, licence required). Private parking for 2 cars. No smoking. Please note: There is pond in the garden, 20 yards away and an unfenced stream bordering one side of the grounds. Low riser stairs to first floor. Unfenced stream running the length of one border of the land. This property may not be suitable for pets.